Our 5 – 7 day L.I.F.E. 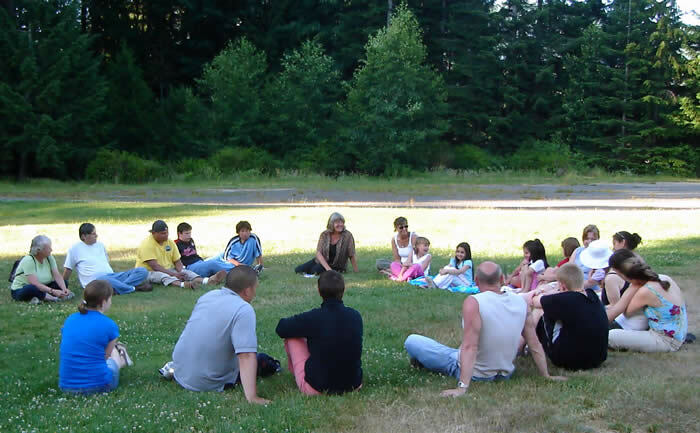 Sessions offer families and other participants a unique opportunity to learn, work, and play together as a community, and to gain what many describe as a life changing – even life saving – understanding of Fetal Alcohol Spectrum Disorder. Participants have the opportunity to interact with each other and with our team; to engage in classroom and experiential activities which offer them an understanding of the support needed for individuals who are affected by FASD; and to experience an environment where the contributions made by those with FASD are recognised and appreciated. For more information about how you can bring a Whitecrow Village L.I.F.E. Session to your community, click here to contact us. **NOTE: We are able to tailor the formal training portion of L.I.F.E. sessions to be specific to various professionals and groups upon request. To inquire about this possibility, please click here to contact us. At a Whitecrow Village L.I.F.E. Session, persons from all aspects of community come together in an atmosphere of respectful relationship. Parents, professionals, children, and staff work to develop a common understanding and to move toward a shared vision of society. Together, they form a cohesive culture in which each unique person finds belonging, value, and is genuinely celebrated for who they are and for the diverse perspectives and abilities they bring to the community. Within this community, each person can find the necessary safety to begin a healing journey. Our L.I.F.E. 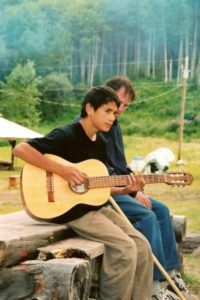 Sessions demonstrate that, within a strong and healthy community, the strengths and gifts of people with FASD can be their most notable qualities. Whitecrow Village programs are rooted in principles of interdependence, which assert that no one person has all the knowledge, skills, and abilities needed for a healthy and successful life and, therefore, that it is constructive to rely on one another for complementary strengths. Wholesome, appealing, and frequent meals and snacks – prepared without processed foods or added sugars – are an important element of each L.I.F.E. Session. We have found that regular nutrition breaks that do not include pop and sugary treats make it easier for children and adults to be calmer and happier throughout the day. We have also discovered that having three substantial meals and three snacks each day is a natural way to make smoother transitions between activities. Our menu is simple but varied; with something for every taste. Families often ask for recipes so they can continue to prepare their favourite dishes at home. View our sample daily menu. One of the practical implications of FASD research findings that we make use of at the Whitecrow Village L.I.F.E. Sessions is the importance of a predictable and consistent routine. Our adherence to a model of consistency and accessibility minimizes potential problems arising from the primary disabilities associated with FASD, and cultivates an environment that supports success. Every day follows the same structure. This alleviates anxiety for participants As well, visuals and graphics are posted in common areas to explain routines in clear terms. Rules are concrete and apply to everyone; thereby avoiding the need for abstraction and interpretation. Built in frequent nutrition breaks and rest breaks are integral to keeping the community healthy and positive, and make transitions easier. Find a sample L.I.F.E. Session DAILY SCHEDULE here. L.I.F.E. Session activities are planned to support and enhance our success-oriented environment with a sense of fun, learning, contribution, and discovery. The specific activities chosen, the timing of these activities within the daily schedule, the participants involved, and the manner in which each activity is introduced all form part of an intentional design that supports both the strengths and the needs of persons with FASD. Children have active mornings (hiking, swimming, canoeing, music, etc. ), leading to improved attention and self-regulation. Families spend afternoons together, working on crafts or participating in sport activities. Activities and craft projects introduced early in the session facilitate familiarity and develop confidence in participation. Ample time for demonstration and mentoring is built into our schedule. Sessions build on learning and social connections as tools in developing a sense of belonging and community. Activities engage participants with a wide range of interests and skills in an emotionally and physically safe manner and demonstrate that a group with a diversity of abilities can interact positively. From toddlers to teens to parents and grandparents, our sports, games, and craft activities build shared good memories in work and at play. L.I.F.E Sessions offer the unique opportunity for classroom learning complemented by mentoring and experiential FASD training. Daily academic sessions for adults are tailored in depth and content to address the varying needs and backgrounds of participants. Topics range in scope and explore FASD and its implications from scientific, societal, personal, and professional perspectives. Diverse presentation formats include discussion, video, lecture, art, and interactive panels, and ensure that the educational programming at Whitecrow Village appeals to all learning styles. In keeping with the Whitecrow Village vision to create an environment that engenders success, drugs and alcohol are not permitted at L.I.F.E Sessions. Optional 12 step meetings are available each evening to all participants, volunteers, and staff. These meetings are significant not only in support of the efforts that many in our community are making toward addressing addictions, but also as an opportunity to integrate the 12 step model with an understanding of FASD as relates to addictions and addictions’ recovery. Participants frequently remark that the daily 12 step meetings are an integral part of their positive and successful experience at Whitecrow Village. Each day at Whitecrow Village is brought to a close with staff and participants coming together to share, listen, and understand as a community. A feather is passed from person to person and every member of the circle is invited to make a contribution – be it through stories, jokes, reflections, or through silence. The Circle affords the space and opportunity to understand and appreciate each person’s perspective and to recognise that every perspective is needed for us to be complete and whole in community. Though Tina’s mother was reluctant to give Tina the feather for fear of her damaging it or refusing to share, the custom of the circle celebrates the contribution of every person. Thus, when her turn came, Tina was handed the feather. With the feather in her hand, she walked silently around the circle, touching each person gently on the head with the feather before resuming her seat beside her mother, where she silently remained for the duration of the Circle. Each of us felt the blessing of this small child’s understanding. **PLEASE NOTE: L.I.F.E. Sessions are intended to be a family experience. As such, all persons 19 years and under of age are required to be accompanied by an adult caregiver or legal guardian.